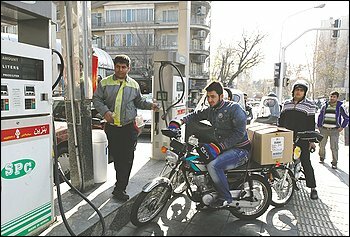 TEHRAN – Thousands of Iranian truck drivers began a second day of strikes Tuesday after a sharp increase in the price of diesel fuel, transportation company officials said, as the Obama administration announced a further tightening of economic sanctions intended to pressureIran over its nuclear program. The apparently spontaneous strikes in several cities were the first sign of public discontent since President Mahmoud Ahmadinejad’s government raised fuel prices Sunday as part of an elaborate plan to slash state subsidies in the coming weeks. “At least half of all truck drivers in the country are on strike or not working,” said Mohammad Arjmandi, a manager for a Tehran-based transportation company. Those who were working, he said, had raised their fees for transporting goods by nearly 40 percent. Under the new plan, truck drivers will have to pay more than 20 times as much for diesel fuel, which has been heavily subsidized in Iran and is still extremely cheap by U.S. standards. Truckers can fill up their tanks once during the next month for the old price of $0.06 a gallon. But after that, they will have to pay $1.32 a gallon. The price of non-diesel fuel is also going up, but less drastically, with a maximum price increase of 60 percent, to about $2.65 a gallon. Although the government has stockpiled products such as rice, cooking oil and detergents to limit price increases, the strikes could paralyze Iran’s distribution system, which in turn would spark a jump in demand – and prices. “The prices of many items will go up because of this,” Arjmandi said. The sale of diesel fuel has plummeted since the new prices went into effect Sunday. The head of Iran’s gas station syndicate, Bijan Haj Mohammad Reza, told the Ayandeh News Web site that almost 73 percent less diesel was being sold. Iranian officials denied that a strike was going on but acknowledged that dozens of truck drivers did not work Monday. “Only 60 drivers did not work yesterday,” said Mohammad Rouyanian, head of the National Transport and Fuel Consumption Management Committee, according to the semiofficial Iranian Students News Agency. He also said that out of 2,500 transportation requests nationwide, only nine were not honored. Transportation companies said Tuesday that they did not have enough drivers on hand to send goods from the capital to provincial cities. “The drivers are striking, but I don’t know for how long, since many have to pay monthly installments for their trucks,” said a transportation manager who gave only his first name, Saeed. Department stores in Tehran were devoid of customers Tuesday, the date that Iranians celebrate Shab-e Yalda – the longest evening of the year, also known as the winter solstice. Traditionally, families gather in large numbers, eating fruit and nuts while reading poetry. “Last year, our store was packed with customers,” said a clerk at the Shahrvand department store in the upper-middle-class Sa’adat Abad neighborhood. “They must be saving their money,” the clerk said. The government has said that all prices for basic goods will be controlled and that anyone raising prices beyond government parameters will be arrested. Bread prices were officially tripled Tuesday, from 10 cents to 30 cents a loaf, the semiofficial Fars News Agency reported. The U.S. Treasury Department, meanwhile, added five companies or institutions and one Iranian businessman to a U.S. blacklist Tuesday, effectively freezing their U.S. assets and barring American companies from doing business with them. All were linked by U.S. officials to Iran’s Revolutionary Guard Corps or to a shipping company used by Iran to smuggle parts for its nuclear facilities. and advanced missiles. The measures were the latest in a series of moves intended to sharpen the economic pain for Tehran ahead of a round of nuclear talks late next month. Obama administration officials say the sanctions are having a cascading effect across multiple sectors of Iran’s economy, including petroleum production, capital investment and shipping. One of the firms added to the blacklist was Moallem Insurance, an Iranian company that provides maritime insurance for the Iranian shipping conglomerate IRISL. The shipping firm has been dropped by major international insurance providers and has defaulted on more than half a billion dollars in loans, Treasury officials said. “Our policy is to continue to impose pressure on Iran as long as it continues to violate its obligations,” said Stuart Levey, Treasury undersecretary for terrorism and financial intelligence.